Enjoy a full day excursion from Paris to the D-Day Beaches in Normandy in the company of an official guide, who will bring these historic sites to life. You will leave on an air conditioned bus at 7:00 a.m. from our PARISCityVISION agency, located in the center of Paris, a few feet from the Louvre. The trip to Normandy allows you to enjoy the beautiful French countryside and see the lovely Normandy landscapes while you listen to the initial commentary by your guide. You will arrive at around 10:15 a.m. in Caen to enjoy the visit to the Memorial, the first step in your Normandy stopover. You can take your time to discover the Museum of Peace, a museum that is a symbol of the History that commemorates the main stages of the Second World War. You will see models of military planes, jeeps or cars of this era; photos and texts illustrate the horror and terror of the conflicts; films plunge the visitor into the emotional turmoil that was the Battle of Normandy and D Day of the Normandy Invasion. You will then have some free time for lunch inside the Caen Memorial, in a restaurant of your choice: The Café of the Memorial, the restaurant “La Terrasse”, that offers traditional cuisine in a warm inviting setting, or the restaurant “Les Pommiers” which has an all you can eat buffet of dinners or desserts. The afternoon brings us to the Landing Beaches, the first being the Pointe du Hoc. Located between Utah Beach and Omaha Beach, the Pointe du Hoc saw the American Rangers scale this cliff, 30 meters high, to fight the Germans, who were equipped with an enormous artillery. The remains are a witness to the hardships of this battle. 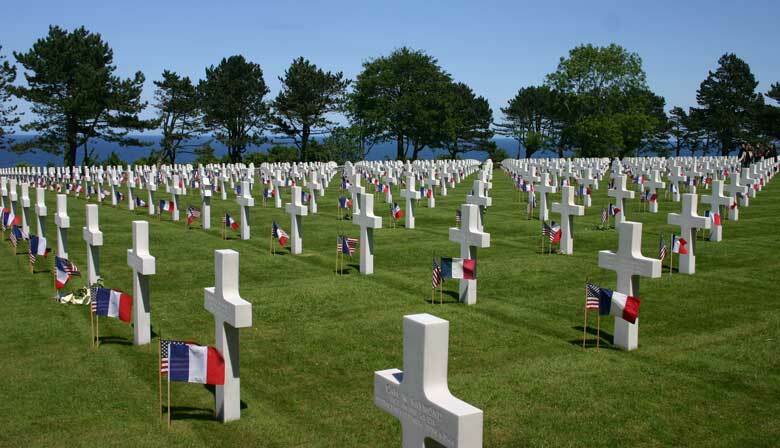 With your guide, you will be led to the American cemetery of Saint-Laurent, de Colleville-sur-mer, which overlooks the bluff over Omaha Beach. There are many Americans who go there to meditate and pay homage to their relatives who fought for France. Spreading over 70 hectares, the site holds more than 9,380 white marble headstones, the memorial, a chapel and the Garden of the Missing. You will have about an hour to visit this symbolic location from where you take a path to get to Omaha Beach. The last stage will be at Arromanches and/or Juno. Arromanches is famous for the artificial harbor that was erected on D Day, June 6, 1944. You can then see the beach of concrete bunkers, or “Phoenix”, which was used for the discharge of almost 9,000 tons of ordnance by the Allies. Juno Center pays tribute to 45,000 Canadians who fought on the side of the French during the Battle of Normandy (June 6, 1944 - August 25, 1944). This photo stop will allow you to relive the landing of these soldiers. During the entire day, you will be steeped in the History that has affected many nations via your guide’s comments and by visiting these symbolic sites of the Second World War. You will then make your trip back to Paris on board our bus for a return that is expected to be at around 9:00 p.m.
You will receive your confirmation and your tour voucher in 2 separate emails. Please print your tour voucher and redeem it to the PARISCityVISION office on the day of your departure. Experience the Landing Beaches, the American cemetery, the Pointe du Hoc. This excursion to the Landing Beaches is the only one that gives all of us, the opportunity to touch recent history (our parents were part of it) and therefore has a resonnance in our today lives. Sad stories over there but happy ending, and it is specially touching, as a guide, to evoke this paradoxe. Excellent. Couldn't have been considering the time allotted and price paid. Wonderful tour and inspiring experience. Carlos was amazing and very helpful. Excellent commentary by our tour guide. The bus was somewhat cramped for such a long trip and for someone like myself with long legs--could have used more leg room. The places we we're able to visit were wonderful. The tour guide was not efficient with time management on sites! We were rushed to get in bathroom breaks! Also, the last stop for a snack supper had us eating from vending machines! That was very disappointing!